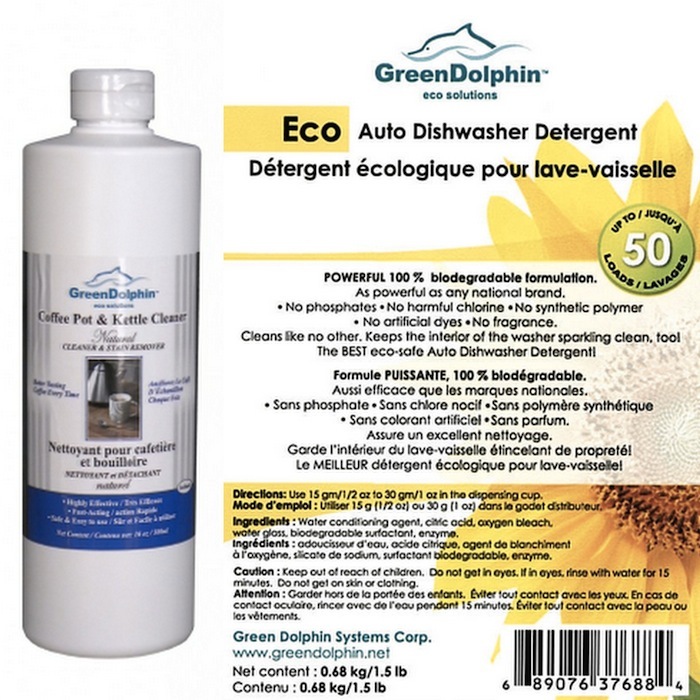 Green Dolphin products are eco safe solutions for our home. I tested three of their products, the green bin deodorizer, calcium lime rust buster and stainless steel cleaner and polish. I like the feeling of using eco-friendly products that doesn't have abrasives, solvents and VOCs. All the products are made in Canada and can be bought online. Although the solutions are safe to use around children, please keep it away from children and be careful not to come in contact with eyes and skin. I used the green bin deodorizer on our green bins, which instantly eliminated odour. I usually wash the bin every time I change the bags but I liked spraying this solution then washing it to remove "unseen bacteria" :) Useful to have especially during the hot months when the outdoor green bins start to smell so easily. This solution is known to remove bacteria found in green bins, garbage cans, compost, diaper pail that is caused by spoiled food, animal waste, vomit and pet stains. Just spray and it will neutralize the odour. It does have a strong apple scent. The stainless cleaner and polish is a high performing, solvent-free polish that is good to be used on any type of metal surface such as stainless steel, aluminum and chrome. The solution removes grime, fingerprints and watermarks. I used it on few of our kitchen appliances such as the fridge, sink, outside of the kettle and it worked well. It leaves a protective coating and prevents the surface from deteriorating. I like that the surface was smooth and it had no oily film afterwards. It is easy to use this cleaner and polish by shaking it well, then applying onto a lint free cloth and wipe the area. Afterwards, buff with another lint free cloth. The solvent is made using water, organic polymer and surfactants from botanical sources. The calcium lime rust buster is an eco-safe kitchen and bath multi surface cleaner that is safe and biodegradable. It removes rust stains, hard water and mineral spots around the sink, drains and toilets. Spray the solution, let it stand for a few minutes, scrub with a brush and rinse. Do not leave this product for a long time on metal surfaces. It removes minerals from our washrooms and sinks without the harsh toxic chemicals. This safe product is made with coconut based non-ionic surfactant and salts. Use this code: CREATE to get 20% off until August 8th. 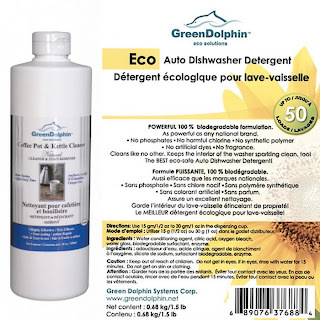 Green Dolphin would like to offer a Canadian reader of Createwithmom and Torviewtoronto a chance to win a package of Eco Auto Dishwasher detergent and a bottle of coffee pot and kettle cleaner. To enter this giveaway please leave a comment on this post before July 15th. Please follow me on twitter and Facebook so I can let you know the winner (this is for ease of contacting not mandatory). Follow Green Dolphin on twitter to know about their new products and other information. I am joining the Great Canadian Blog Bash 2012 to celebrate Canada day on July 1st :) There is no place like home. Follow #TGCBB on twitter to find out about different giveaways hosted by Canadian bloggers. Thank you for offering this giveaway. Sounds like a great new product, never heard of them before. Following you on Twitter & Facebook. Thanks for this giveaway! Sounds like a great product to try! Thanks for the information! I need something to keep my outdoor garbage/recycling bin smells in check. Thank you for the giveaway! I'd love to try these out!! We have really hard water so the calcium lime rust buster would be great. I hate how the shower head sprays water everywhere. Hi there, thanks so much for participating in TGCBB. Glad to have you! I use natural products and would definitely love to try this one! Thanks for making this all-Canadian! Happy Canada Day! Hi there!! Thanks so much for joining us this year and I hope your having a nice time getting to know some fellow Canadian bloggers with #TGCBB. I have never heard of this products but they sound wonderful! Have a great Canada Day Weekend!! I hadn't heard of Green Dolphin before. I'd love to try it out! Thanks for the giveaway. Enjoy the rest of #TGCBB! Hope to be able to give this a try! Thanks for the giveaway! Awesome! I hadn't heard of this company until today, either. Thanks for the introduction and for the lovely Canadian giveaway. I'd love to try these products. I follow you and Green Dolphin on twitter as @rararomp. I'm your new FB fan Raegen T.
Thanks again, hope you have a great weekend! I would really love to try these amazing products! Thank you for the giveaway! Happy Canada Day! Thank you for the opportunity to win this product. I'm always looking for eco-friendly products to try. I follow you on facebook. I always like to try the eco friendly products as opposed to the harsh chemical products. These sound great! I would love to try these! We love eco friendly products around here! Sounds like a great product. I like to try green options whenever I can.